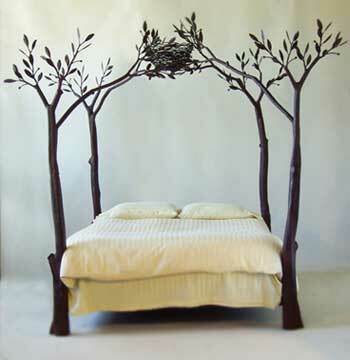 Contemporary Beds- The Tree bed.. Contemporary bed made to look like 4 trees. This metal work bed is cool and contemporary..
Great focal point in a bedroom.. I'm 100% sure its would suit a master bedroom but in the spare room guests would just love this bed.
" Shawn Lovell graduated with high distinction from California College of Arts and Crafts with a degree in sculpture in 1993 and has since established a metalworking studio in Oakland, California. Shawn uses traditional forging techniques as well as modern welding fabrication to create her one of a kind pieces."